The C14 is a technical climbing oriented crampon with a variety of configurations, similar to the Black Diamond Cyborg or the Petzl M12. 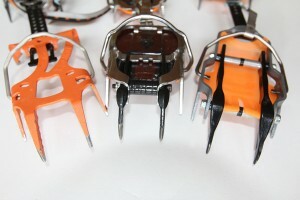 If you haven’t already, read the Black Diamond Cyborg vs Petzl Dartwin Comparison for comparison. Cassin C14 offers the ability to run with dual points, a centered monopoint and front and back antibot plates either on or off. 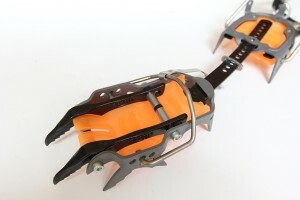 This style of configurable crampon is great if you’re ice cragging one day and mixed climbing the next. Just pull out a couple of bolts, reconfigure, and you’re set to go—all in a single pair of crampons. As I mentioned in the Cyborg/Dartwin review, all of these crampons feel nearly identical in terms of climbing performance. The C14 front points and general design are extremely similar to crampons like the Cyborg, and thus have many of the same climbing features: Aggressive secondary points, rake points, and plenty of long downward facing points for walking on snow. The chromoly front points are well made and are easily replaceable, permitting a long product life. The real differences are again in the subtle details. The C14 is tad bit heavier at 579g per crampon than its cousins the Cyborg (560g fully loaded) and the M10 (558g with Antisnow plates). Not a large difference, but notable as you start stripping down features towards something like the Dartwin (420g). The antibot plates are a little flimsy, and their attachment to the crampon is not nearly as snug or secure as the Cyborgs. The plates are curved to provide “active” snow clearing, which means that there is some space between the crampon bits and the top of the plate. I found that this allowed small debris to get pressed up in between the boot and the plate. Admittedly this is a minor annoyance, but is not an issue I’ve found with other antibot designs. Overall these antibot plates feel more like an after thought and I would probably ditch the weight and climb without them most of the time. The crampons length adjustment is a familiar tool-free spring-loaded pin setup. This is nice as it’s easy to swap these crampons around between different footwear. One disadvantage of the C14 design is that you must remove the rear antibot plate to adjust the length. Overall these crampons climb very well–on par with the Cyborg and Dartwin, and will be heaps better than your older style crampons. While some design tweaks would be welcome, these issues are mostly just in the annoyance category.